A novel artificial esterase based on chitosan and amino acids was synthesized in the present study. The Fmoc-His and Glu were linked to chitosan by active ester method(AEM). The hydroxide radical in chitosan, imidazole group of Fmoc-His and carboxyl from Glu formed a catalytic center of natural esterase. Gel microspheres were coated with a protective layer and a supporting layer by self-assembly construction function in carboxymethylcellulose sodium(CMCS) solution. 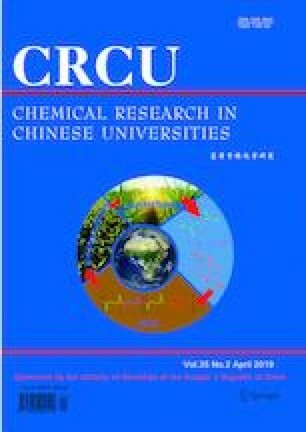 As for catalytic activity, chitosan-His-Glu was found to be more efficient than chitosan- His and chitosan-Glu in mimicking the core catalytic sites of natural esterase, and the best ratio(mass ratio) of chitosan-His-Glu:CMCS was 1:3. Furthermore, metal ions, such as Ca2+, Mg2+, Fe2+, etc., were able to improve the catalytic efficiency of artificial esterase. And the Lineweaver-Burk plot indicated that the catalytic kinetics of artificial esterase conformed to Michaelis-Menten equation. Supported by the National Natural Science Foundation of China(Nos.31501571, 31772071), the Fund of Agriculture Research System, China(No.CARS-05-05A-03) and the Innovation-driven Development Project of Guangxi Province, China (No.AA17204043-2).